I'm a little late today getting this out due to being a bit sick this last week. How sick? Sick enough we had to skip the weekly game.....which does not make me a happy GM. I "fondly" remember, back in the day, when I wasn't able to have a weekly game....or really any game. Not old enough to drive, no other gamers within walking/biking distance, nothing I could do. A few things kept the gaming spark alive for me. Pouring through old copies of Dragon, painting the few minis I could get, and playing with choose-you-own-adventure books. Man I loved those books. Of course I "cheated" like hell. One thing I did was map out the adventure as I went along, writing entry/room numbers on my map. If I ever got to a dead end, or simply needed to get to a specific room, I just used my map to pick the correct entry. 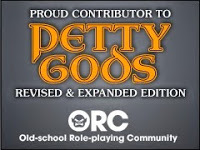 This really helped with the few books that had you actually track hit points and engage in combat. If you knew where the room with the healing font was....well you were much more likely to survive until the end of the game. 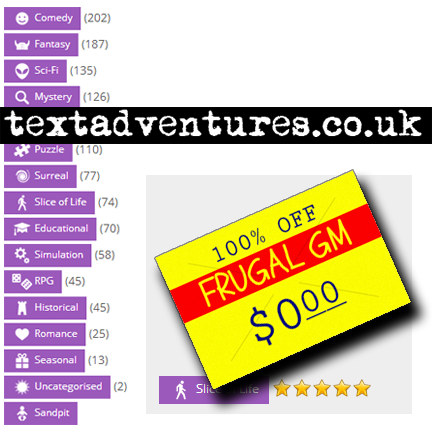 Textadventures.co.uk is a website filled with a variety of these text-based adventures, divided among 16 genres. I really recommend signing up for a free account and joining in on the fun!